Can I Backfill My Pool with Dirt? No. Done simple and straight forward. Inground pool builders who use dirt, clay, or red pan; generally don't have your best interest at heart. Are their exceptions? Maybe. There are different types of pools and some can be a little more lenient than others. If you can't backfill with dirt, what should you use? Chipped clear stone, preferably not round stone or pea gravel. Understand one thing, using the dirt you excavate to backfill your pool will reduce your inground pool prices. Simple, never use dirt to backfill your fiberglass pool. 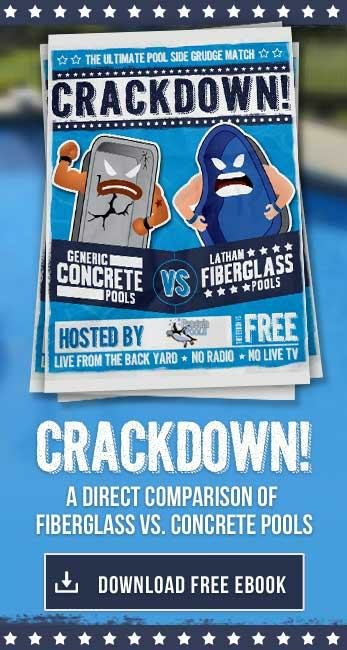 If you allow your inground pool builders to use dirt, you are getting ripped off and taken advantage of. The weight of the settling dirt with any water retention can cause the walls of the pool to bow in. The increase in hydrostatic pressure is immense, which can cause your pool to float or just crack completely. There is no reason to ever use dirt, period. 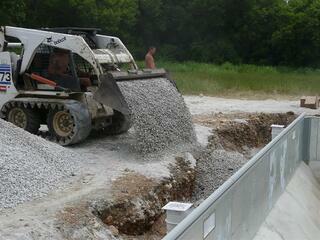 Sand is some regions of the country can be used to backfill as there is no freeze concerns. The debate between sand and stone backfill has been going on for years between inground pool builders, fiberglass manufacturers and anyone that has an engineering degree. For my money, using stone backfill is the best way to insure that you don't have those issues especially since I am in a freeze region that has a 4' frost line. What Type of Stone Should I use for Backfill? A clear chipped stone is the generally regarding as the best stone for backfill, same as around the foundation of your house. The stone is generally 3/4" - 1" in size and doesn't contain any "fines" or limestone dust. The chipped limestone will lock with the other stones around it making it harder to settle and compact. Stone with the "fines" or limestone dust, needs to be compacted every 4" and watered down which doesn't make it an ideal media for backfill. The best part of the chipped limestone is that there are air voids between the stones so it can pass water through it very easily, something that is critical around pools. The simple answer for you is NO. Are there work around depending on the pool you are building, sure? Inground pool builders who tell you that dirt backfill is fine to use, is generally hiding something and is just trying to give you the best inground pool prices. The following items are all true, but should it really matter when trying to build something that will last for decades? My only concern is that if you are trying to cut costs on your backfill and your pool contractor is allowing that to happen, what other corners are being cut. Inground pool prices will go up with the need for stone and dirt removal, but you are doing this once and it shouldn't be a factor. The cost savings of using stone backfill over dirt initially is roughly $2,000 - $4,000 depdnind on where you are located.